A trading post location in the northeast corner of New Mexico on the Navajo Nation reservation. 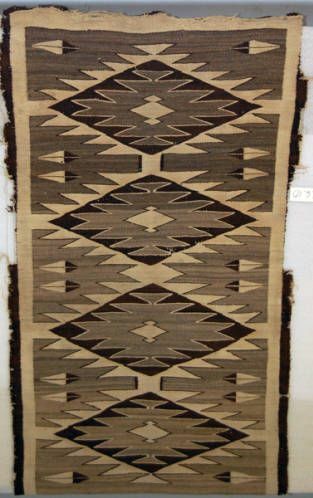 This trading post is most well known for its unique neutral colored Navajo rugs, a style which originated when the post's founders Frank and Henry Noel showed the weavers pictures of Persian rugs. A trading post is an establishment where goods can be traded. It is also a social center where news and gossip are exchanged. Trading posts have been associated with American frontier culture since seventeenth century. Overtime, trading posts developed into a cultural institution, at first funded and backed by empire, later by national interests, and most often by enterprising business men. Trading posts became centralized hubs in a network of exchange that both participated in and circumvented the burgeoning capitalist system that was imported into the Americas along with settler colonialism. Although trading posts were intially intended to provide support to the European traders and trappers who traced their way over the North American continent, Native American groups were also drawn into the posts' exchange network, trading furs, pelts, and even scalps for finished goods such as steel knives, firearms, woven textiles, and food stuffs, including alcohol. Although not every post was poorly managed, trading posts earned a nefarious reputation for taking advantage of Native traders, by offering poor exchange rates, trading with products that were infected with diseases, and promoting the purchase and use of alcohol. Many trading posts are still in existence, and in the Southwest, they still mark "the frontier," as they are located, as they have been for centuries, at the dividing line between wilderness, Indian coutnry, or reservations and settled, ordered, and contained "civilization." Today, however, trading posts can be reached by pickup truck, tourist RV, and even the occasional horse. Many trading posts are also preserved as National Historic Sites. Two Grey Hills Navajo rug done in shades of brown. This rug was a wedding gift to Elizabeth King and Charles B. Johnson from Willis and Ella King Martin. 2001 Tony’s Hillerman’s Navajoland. Salt Lake City: University of Utah Press.